May Day! 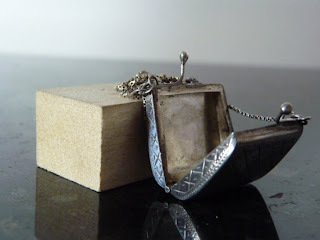 In this merry month, the Passage will offer an array of of jewelry posts, for reasons which may reveal themselves to me. Sometimes a statement can be subtle, sometimes a secret is the loudest song. I love jewelry with a secret message, charm or detail. They are nearly always handmade, idiosyncratic and personal. 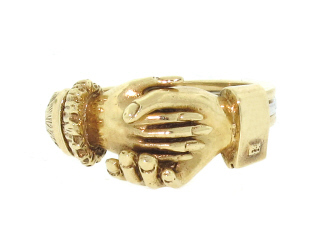 A vintage 14k gold clasped-hand friendship ring is but one of Beladora II's treasures. Ca. 1965 but has a definite Victorian appeal. See how it opens to reveal a white gold heart? Price, $695 from Beladora. A vintage silver "purse" pendant (on an 18 1/2-inch chain) opens to reveal a small compartment. A mysterious little piece to mix with your pearls or beads. You might put a dab of fragrance on a bit of cotton to wear inside the bag. Price, $52 from etsy seller FourSailAccessories. Gemma Redux make an envelope ring, with your choice of message for the customizable gunmetal plate insert. 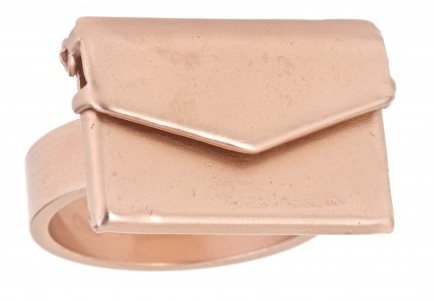 Shown, in rose gold plate over brass, and available in many colours and finishes. Price, $137. The Victorians encoded messages by choice of gemstone; the acrostic ring or bracelet used the gem name to spell a message. 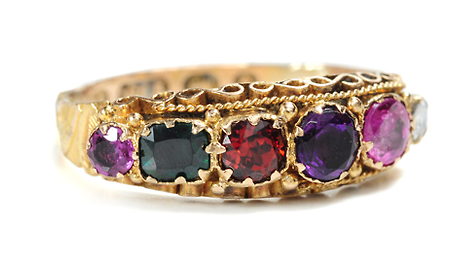 This is a "Regard" ring (Ruby, Emerald, Garnet, Amethyst, Ruby, Diamond) but they were also made to spell names or initials. This one, from The Three Graces, is sold. My friend Peg wears a three-stone ring made in pearl, emerald and garnet. Another kind of secret is in the use of the material, for example, a diamond that does not read as such. 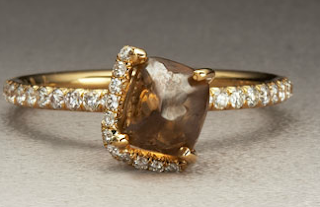 A Diamond in the Rough (TM) ring, features a brown natural rough diamond (certified conflict-free), a 1.89 carat secret. I love the setting. Price, $4,600; from Neiman Marcus. A last secret! Hidden Meaning Symbol jewelry is an ingenious cipher that allows any message (in all languages using the Roman alphabet) to be interpreted within the piece, which comprises all letters and numbers (from 0-9) within what the creator calls the Meridane Symbol. 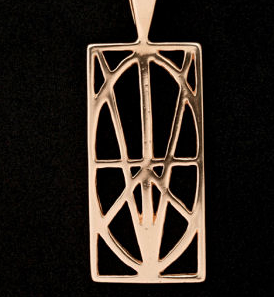 The design, which reminds me of Frank Lloyd Wright's work, is available in a variety of materials and pieces: charms, pendants, rings, bracelets. I like the 14k gold pendant ($525), though pewter, at $27, would be a pleasing gift, too. Secrets are made to be kept, but I've had fun sharing these with you! 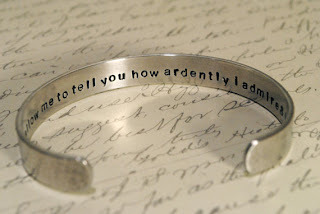 You have been extraordinarily kind in your jewelry posts about showing items from Beladora.com and Beladora2.com. Thank you. Please contact me at sales@beladora.com. Very cool! I inherited a ring from my grandmother that has all of her grandchildren represented by birthstone. I never tire of picking out which stone represents which cousin. Belle: The pleasure is mine, you have special pieces. Have e-mailed you. sisty: What a significant heirloom, I'd love to see it. Mardel: Yes, *that* is a "diamond for women who don't wear diamonds". I like diamonds but not in the usual applications. My Mom gave me her "family" ring, the birthstone for Mom, Dad, Me, Brother. I don't wear it a lot but treasure it just the same. Oops, that should be birthstones (4) for each of us, we weren't all born in the same month. 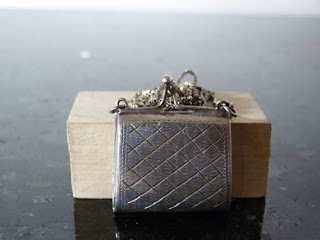 Love these interesting pieces especially the rough diamond. The message bangle could be a fun way for a proposal..."will you marry me?" and a keepsake. Sharing a secret with a loved one is so intimate. You must have fun coming up with new a different ideas for your jewelry themed posts. Darla: That's what I figured, thanks! hostess: Am engrossed by the topic, so they almost write themselves. perhaps you have given someone the idea for a proposal. Love the victorian acrostic ring, or if not that specific one, the general idea. Thanks for the education! These are lovely quirky little pieces. Wouldn't say NO to the Diamond Ring. Very charming pieces, all of them. What an interesting post, the rough diamond is beautiful as are the vintage pieces, so much more attractive than honking big diamonds.